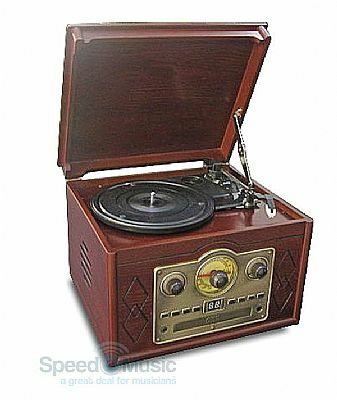 The Steepletone Chichester II Nostalgic Record Player with Radio CD & Cassette Player is perfect for you if you have a love of old-fashioned design.Take a trip down memory lane with this classic art-deco style music centre from Steepletone. 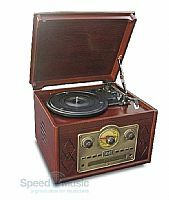 Finished in mahogany or light oak look wood veneer, this clever sound system consists of an FM and MW radio, a record deck, a CD and a tape player. 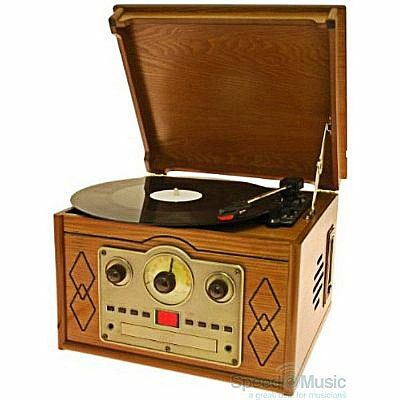 Play your new and old 33, 45 and 75 rpm records, your favourite CDs or tapes, and tune in to your choice of radio station. Built in 10 watt speakers deliver great stereo sound for quality listening. 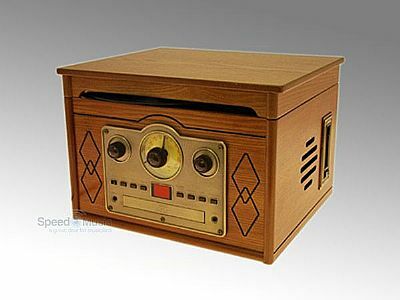 Also featuring a handy line-in socket, you can connect an iPod/MP3 player and enjoy your digital music too. The stylish design and quality workmanship ensures you will be purchasing more than just an ordinary piece of audio equipment – you will be adding a fine piece of furniture to your home. The Chichester is also very user-friendly because of its rotary controls for volume and tuning plus a push button function switch. It even comes with sockets for subwoofer and headphone. Dimensions / measurements 240 x 290 x 340mm (HWD).